This is our most affordable package, designed to fit your budget. This is a basic DJ set up, great for smaller, informal wedding receptions. Similar to the Budget Package, with a little high-end flair. This basic DJ set up adds some basic but effective dance-floor lighting to create energy and ambiance, and bolsters the low-end with a subwoofer to heighten the guests' music experience. Our Silver Package is a big leap in terms of impact. We'll provide music for up to five hours, adding cocktail hour music to the reception, creating a seamless transition between cocktails and reception. A second, compact cocktail-appropriate sound system is provided, if necessary. This package includes a concert-qualtiy sound system and upgraded dance-floor lighting that is controlled by the DJ/MC, creating a dynamic, club-like atmosphere. Our best value for an unforgettable experience. An affordable, selfie-inspired Photo Booth. We provide everything you need for a compact, social-media integrated Photo Booth. Using an iPad, minimal lighting, goofy props, and a proprietary iPad app, this affordable self-operating open-air Photo Booth will automatically upload photos with custom hashtag to Twitter, Instagram, and Facebook. Onsite photo strip printing available. No attendant required. Our professional Photo Booth comes with an attendant, black satin tented booth, touch-screen operation, professional SLR Camera, goofy props, a scrapbook for pictures and message-writing, and print-outs for your guests to take home. Also referred to as "Ceiling Wash," "Up-Lights," or "L.E.D. Lights," our Architectural Uplighting will saturate the room in a color of your choice creating a dramatic visual ballroom ambiance for your event. The base package allows for 10 lights and one color, appropriate for small-to-medium sized venues seating 100-150 guests. Additional lights and colors may be needed to achieve your desired effect and will depend largely on the size of the room. Inquire for details. "Your Name In Lights" custom monogram lighting is a special lighting instrument that will project an single color image of your choice. 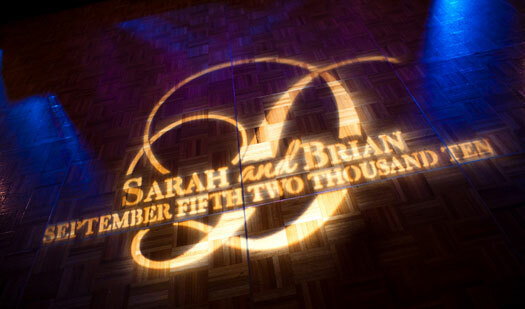 Often the namesof the bride and groom, their initials, monogram or logo is projected on the dance floor. You can provide the artwork, or our designers can create one for you. This is a great branding add-on for corporate events and private parties. 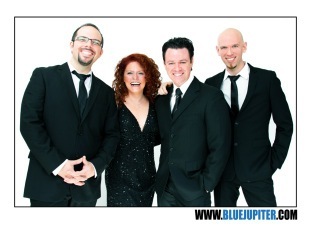 The Ultimate Cocktail Hour with Blue Jupiter: 60 minutes of contemporary pop and jazz standards performed in Blue Jupiter's signature uptempo mix of beatbox and harmony. The Ultimate Ceremony with Blue Jupiter: 20 minutes of prelude music while guests are being seated for the ceremony, plus one song for the processional and one song for the recessional. Choose from Blue Jupiter's repertoire or request a custom arrangement of your favorite song (additional charges may apply). Display a slide show on a 50" LED display at your reception for the ultimate in personalization. Up to 100 photos will cycle during your reception for all your guests to see. Include photos from childhood, family, friends, or recent photos from when you met! It’s a great way to customize your event and add a special touch.